He aha te kai o te rangatira? He korero. One by one, we awoke for our final morning together in Aoetearoa. While packing my things, I reflect on the wharanui (carved houses) itself, the stories it tells, and its representation of Māori sovereignty. 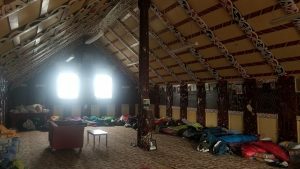 Interior of the Hairini Marae. The history of the Hairini Marae was displayed all around us within the wharenui. Poupou (carved wall panels) represent actual ancestors and tell the history of those who first came to Aoetearoa. Photographs of more recent ancestors line the wall – their lives’ histories emanating from the prints into the room; their spirits offering protection and guidance. This was absolutely one of the most amazing places I have ever been privileged to sleep. 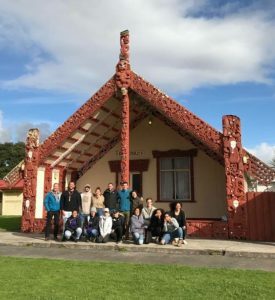 Not only is it a sovereign space where Māori are empowered to accurately represent themselves and their past through carvings, but it is also an environment that fosters language revitalization and kinship. He aha te kai o te rangatira? He korero. What is the food of the leader? It is knowledge. It is communication. While we ate breakfast we shared stories of our own. Some of us took one last walk around the town, enjoying some of the finest weather we had during our whole trip. We quickly cleaned up the Marae before we took two taxi-vans through town to catch the InterCity bus to Auckland. At first glance, the asthetic beauty of the place is without measure. Rolling hills, clouds resembling castles, sheep resembling clouds. After closer inspection, a story emerges. As an ecologist/naturalist in training, I had about five hours to observe the landscape and interpret this story. An altered landscape. A lone tree is left to tell the story of the forest that once adorned the hillside. Mankind’s impact in Aotearoa and North America closely resemble one another. 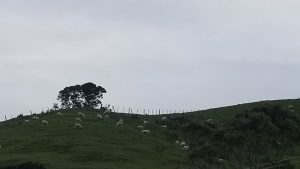 The land nearly unrecognizable in terms of its ecology before European settlers carried out the land acquisitions in violation of the Waitangi Treaty meant to ensure Māori sovereignty over land rights. I see pastures where sheep and cow roam, streams in which farmland runoff flows among the trout, hawks surveying for creatures now too easily spotted in a clear-cut forest. As I read the vegetation regimes and typography like brail beneath fingertips, I imagine the past as three chapters. In the first chapter, before mankind had set foot here, the pages tell of a primeval wonderland where ferns the size of trees (Ponga) tower over flightless birds the size of giraffes (Moa). In the second chapter, the land is inhabited by Māori 800 years ago. It is the Aoetearoa of richly gardened landscapes where mankind interacted with its soils, flora, and marine life in near-perfect harmony. In the third chapter, the settlement of Pākehā (non-Maori) Europeans who confiscated ancestral land, clear cut forests for timber, channeled and dredging waterways, and even gave everything a new name. The next chapter of Aoetearoa is being written, and the future of Māori sovereignty is more promising than it has ever been since European colonization. It is Te Reo week (Māori language week), where events all over the country are promoting language revitalization and ancient stories. Land rights are slowly being regained through storytelling within the treaty claims process. Indigenous leaders of tomorrow are carved by the stories told by elders and the land. The responsibility of these leaders is to remain steadfast in a world where colonization remains vigilant. As we share our final meal, I am surrounded by friendships. Koha (gifts) are given out in the forms of bracelets, woven blankets, and laughter. This has been a truly transformative and enlightening experience that I will never forget. I am filled with joy. I am filled with knowledge. And boy do I have stories to tell. This entry was posted in Our Experiences on September 17, 2017 by Steve Guardi. 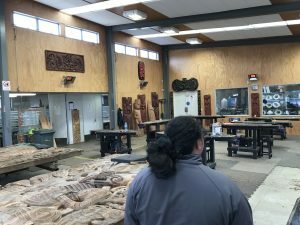 During our class visit to Rotorua we spent our whole day at Te Puia and the New Zealand Māori Arts & Crafts Institute. As we toured the facilities it was interesting to learn how different groups of people play a variety of roles in sustaining the campus. 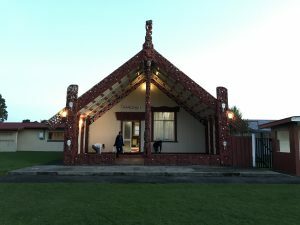 The arts institute is a government-sponsored education center for Māori students that gets all its funding from the public through tourism that’s woven into the site. Similar to the Polynesian Culture Center on O’ahu’s North Shore, the tours make their way through a staged village enclosure. One benefit of this is the ability to showcase the work of past students of many generations in Te Puia’s buildings. Some of the rooms in the school where students were actively producing work were open to walk through as well. A classmate and I both had mixed feelings about this setup because for the surface value it felt very “touristy” and took away from the privacy of the students. 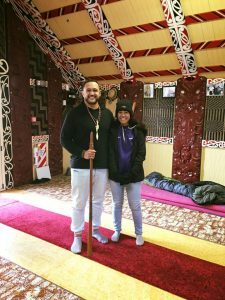 However we both thought that from a perspective of someone outside of the Māori community it could be a very informative way to be introduced to common themes and values of the culture. As long as Māori are the agents of the operations at the center, they can determine what the comfort level for showcasing their culture can be. Carol, our guide for the day, was very passionate about the parts of campus she showed to us. As our class toured through the boardwalk with the views of the hot springs and mud pools, she talked about the pā (village) in proximity to the campus. The pā used to be open to the public to walk through but the families who live there grew uncomfortable with the behavior of certain visitors who would overstep into residencies. She shared her hope for a future where the gates could be unlocked again so visitors could walk through. This is because the presence and representation of the local community is something Carol saw as vital to the understanding of the natural features, not just the view itself. In the summer when the weather is nicer, the children from the pā families can be seen swimming in the geothermal pool closest to their home. Carol says that tourists see this and get confused because they’re not used to witnessing the presence of local Māori interacting with the nearby environment. 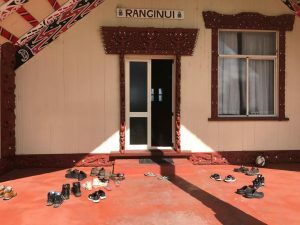 I think it’s interesting that to an average visitor of Te Puia it may make more sense to see Māori of all different iwi working in the “authentic” decorated village center than the local hapu members maintaining relationally with the resources they’ve been close to for generations. It makes me think about how our class is looking at representation and environment. Te Puia’s setup offers a strong example for the values built into Māori material culture, but it is harder to see how people are part of an environment when the natural world is built around purely for speculation. Overall our day at Te Puia was full off great conversations and stories, and it was interesting getting to learn about the unique setup with the school integrated into the tourism site. This entry was posted in Our Experiences on September 13, 2017 by bruecher. Today we had the privilege of speaking to Josh Te Kane, a member of the Hairini Marae iwi. Josh shared his knowledge about Maori sovereignty. Maori sovereignty is a topic we are constantly exploring, researching, and trying to understand. Sovereignty is defined as a supreme power or authority. This leads us to a question I consistently wrestled with, do Maori’s have true sovereignty? Up until this point in time, I didn’t view Maori sovereignty as true sovereignty. Maori’s have sovereignty in specific areas such as within marae’s, kapa haka classes (song and dance classes), and Te Reo (Maori Language) week. It is within these areas that Maori’s are able to experience true Maori sovereignty. As far as a true self-governing state goes, I did not view Maori’s as having true sovereignty. However, once Josh Te Kane shared his insight on Maori Sovereignty, this quickly changed. Josh explained the history of Maori’s up to present-day in a way that helped me to understand sovereignty through his eyes. Europeans arrived in New Zealand in the early 1800’s, which was a time of great turmoil. From the very beginning, Maori’s had a great relationship with the Colonials. They were great tradings of items such as flax, kumara, animals, etc. which were all very beneficial for the Maori tribes. As time went on, missionaries arrived on the island introducing Christianity. Christianity was very similar with the Maori beliefs and faiths. More and more Europeans began to move on New Zealand land, which eventually led up to the land wars. In 1840 the Treaty of Waitangi was officialized. Unfortunately, the English and Maori versions of the Treaty were translated differently amongst the Maori community and European community. There was a large misunderstanding. In 1852, Chief Tamihana Te Rauparaha visited England. He learned about the England monarchy system and wanted to incorporate the same system amongst Aotearoa. Once Chief Tamihana established that there would be an Aotearoa Monarchy system, the hunt for a king began. Chief Tamihana searched from the north to the southern islands, and from the east to the western islands. He asked many different chiefs if they were to take the duties of being King, but many would reply saying, “My waters are too shallow to take care of the masses”. Once Chief Tamihana finally found a King, there was a separation amongst the Maori people. Some Maori’s favored the Queen of England, whereas others favored the Maori King. Since then, many wars between Maori’s and Colonials occurred, as well as wars between different Maori tribes. Up to present day, Maori’s are still coming to terms with all the history that’s happened. Although The Crown rules over Aotearoa, there is still a Maori King. The Maori King doesn’t have governmental powers, however, he is a figure of sovereignty for Maori people. The number of Maori’s who have high beliefs in the King has risen greatly. The King is the glue that has kept Maori’s together. Maori sovereignty is present. It is not lost. The Maori King kept Maori sovereignty alive, but the Maori youth today is what keeps Maori sovereignty growing. In 2013, three high school girls started a petition to teach Maori history in schools. Thousands and thousands of people supported this petition. Maori history is now taught in schools. The young generations of Maori’s are the back bone of keeping Maori’s united as one people. Maori children are able to learn about their history. They are learning and retaining information through their traditional song and dances. Slowly but surely, Maori’s are able to talk about the past and share stories. They are now strong enough to take action towards a better future. Although it is a time of mourning, it’s a time of strong restoration for Maori’s. Maori sovereignty may not be as easily detected, but it is surely alive and growing. Josh Te Kane and I in Hairini Marae. This entry was posted in Our Experiences and tagged Chief Tamihana, Christianity, Land Wars, Maori King on September 12, 2017 by slavulav. Morning alarms around the wharenui began promptly at 7am signaling to the 16 of us that had spent our first night in the Hairini carving house, that it was time to get up and start our day.Once up, people slowly made their way into the dinning house to find that Birdie had graced the group with the preparation of a traditional Native America meal, frybread. Birdie explained the small handful of ingredient needed to make the delicious breakfast and the traditional use of the bread in a number of her family’s Native American dishes back home. After breakfast the group convened for our last class session. 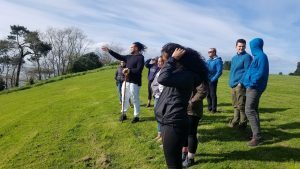 The class began by reflecting on our cold and rainy day spent with Brad learning the history of the Orakei Block, on the outskirts of Auckland’s city center. We discussed the presence of a double standard that has been placed on the Maori people in their fight to reclaim land back from the Crown, leading to a more complex discussion on the perception of Native peoples with power. After our class session we met back in the wharenui to hear from Josh about his perspective on the revitalization of Maori history and sovereignty. Josh started his story in the early 1800’s with the first traveling European colonizers that settled New Zealand. He was able to split the history of New Zealand into a few distinct eras: Pre Land Wars, Land Wars, Land Confiscation, and Revitalization. Using these time periods, Josh told us the story of the lone Maori victory in the Land Wars against the British. At the end of Josh’s historical story he stressed the importance of remembering, restoring, and reigniting history for the Maori people as well as raising awareness through all parts and cultures of New Zealand. There are many places around New Zealand that are still to this day named after British military officials who took part in the mass murdering of Maori men, women and children throughout the Land Wars era. 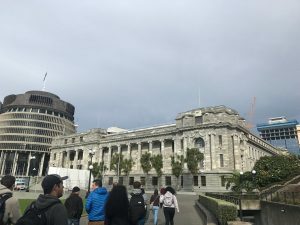 However with the revitalization of history and Maori sovereignty in schools, New Zealand can hopeful find itself on a healthier path forward. To finish the day, at about 5pm the group taxied to town to enjoy a local meal and beach sunset. This entry was posted in Our Experiences on September 12, 2017 by camind. Another travel day, another exhausting day, but also another fruitful day. Today we woke up in Wellington, but will sleep in Auckland once again. The morning started out just like many others: rushed and hectic, with people scrambling to eat their breakfast and pack up their things. 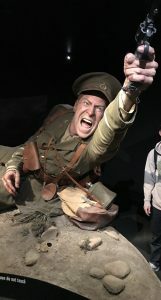 However, as soon as we left our hostel (The Dwellington), things calmed down and we started our voyage back to Auckland. 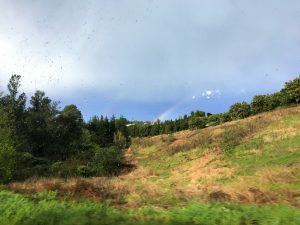 After the shortest plane ride of my life, only 45 minutes in the air, things were beginning to look familiar again as we strolled through the Auckland airport looking for our gracious tour guide, Dr. Brad Coombes. Brad would be giving us a tour of a highly disputed piece of land historically owned by the Ngati Whatua of Orakei and known as the Orakei Block. 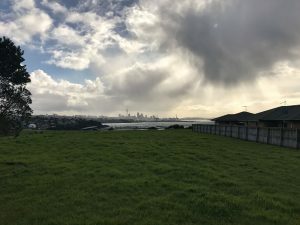 Downtown Auckland from the top of the Orakei Block. 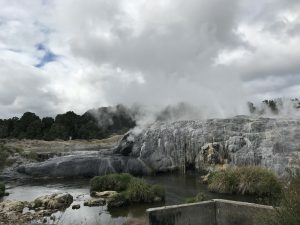 Although severely unprepared for the weather, the group followed, listened, and tried not to freeze our fingers off as we meandered through the Orakei block, stopping at several notable locations. Even though every stop was stunningly beautiful it was hard to pay the views any mind, while Brad informed us of the many evils committed to gain ownership of the land we stood on. From burning down Maori villages to running Auckland’s main sewer pipe right across their beach and into their waters, ruining one of the Ngati Whatua people’s main food sources, it was clear to see that the people here had been mistreated. The pipe didn’t just poison the ocean waters right at their front door, it also decimated the swamp they called home, ruining another food source and causing unhealthy living conditions. All of this happened amidst the Crown’s highly questionable acquisition of the Ngati Whatua of Orakei land. Even though this case of blatant theft seems particularly heinous it is not too unlike many others across the globe and many we have come across in Aotearoa. Land has been, and continues to be, one of the biggest issues faced by indigenous peoples in settler colonial countries. The wrongs committed by the governments of these countries, such as the United States and Aotearoa, damage native people more than most can even imagine. My time here has provided me with a glimpse into their daily fight standing up for their own culture, but without my participation in this course I would have no idea about the struggle of indigenous peoples. I could have travelled all over the Orakei Block and not known any of its storied history just like I’m sure happens all the time when I travel across the United States. Perhaps one of the most important ideas I’ve adopted during my time here is to think critically no matter where I am, to consider who is writing the narrative, and whether I should take it at face value. I acknowledge that these are learned skills that I did not have before coming on the program, but as I spend more time travelling around this country I can’t help but to notice how useful they are. Perhaps if more people can attempt to do the same we can help protect what little indigenous peoples have left. Standing up for them together and doing what we can to right the crimes of the past. This entry was posted in Our Experiences and tagged Aotearoa, Auckland on September 10, 2017 by dmc96. During our short time here in Wellington, I have attained multitudes of valuable knowledge. One specific topic that I correlated very well with, is the concept of “double consciousness”. Double consciousness is a concept that W.E.B. Du Bois (African-American activist) explored in the 1900’s. Double consciousness is a feeling of a divided identity, making it difficult to have one unified identity. This concept was widely understood by many African-Americans during the late 1800’s-early 1900’s when Du Bois first introduced the idea. Professor and Chair of American Indian Studies, Chris Teuton, related this concept of double consciousness to Maori experiences during one of our class sessions on the Matiu/Somes Islands. This concept of double consciousness is easy for anyone to associate themselves with. An example would be an employee versus a company. An employee has this double consciousness and is aware of his/her behaviors due to the expectations of the company. Specific examples relating to the Maori culture in relation to double consciousness would be, Te Reo Maori language versus the English language, or Maori participation in government versus the New Zealand government. In turn, this prevents the Maori from having a unified identity. Viewing this entire experience through an indigenous lens, I am able to relate extremely well with this concept of double consciousness, mainly because I myself have had my fair share of double consciousness experiences. As an indigenous female within a University setting, I am constantly fighting between two separate identities. Meka Whaitiri and I after touring Parliament. I have been able to observe and become aware of this double consciousness concept actively occurring when speaking, listening, and engaging with Maoris, specifically Maoris working for the government, or in other words, The Crown. It’s especially been an eye-opening experience speaking to the Maori Waitangi Tribunal members and Maori Parliament members. Fortunately for our group, we had the privilege of meeting and speaking with members of the Waitangi Tribunal and a Maori representative, Meka Whaitiri from Parliament. Speaking to the Maori Waitangi Tribunal members and Parliament member was a rich experience. Meka Whaitiri, shared a lot of insight on what it is like being a Maori working in Parliament. To begin with, I questioned these Maori’s intentions, motives, and genuineness solely because I was confused as to why they were working for the government in the first place. After speaking to the Maori members of the Tribunal, and listening to Meka speak about her work within Parliament, I came to the realization that Maori’s must master how the government system works, and from that, learn how to work the system in order to help their people. I am proud of the Maori representatives working under the government. Without Maori representatives in the government, Maori’s would not have a voice. 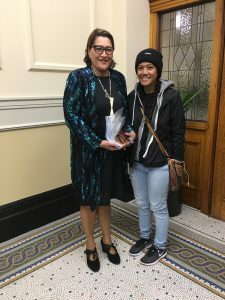 As hard as it may be to work for the government while staying true to their Maori culture (double consciousness concept), I know that these Maori representatives are doing the right thing in order to keep their identity alive. This entry was posted in Our Experiences on September 9, 2017 by slavulav.